Why do we construct nanocomposite for the photocatalytic oxidation desulfurization? Current hydrodesulfurization (HDS) technology is hard to remove thiols and refractory thiophenic compounds to a minimum in fuels. Moreover, the HDS technology requires severe operation conditions, along with other disadvantages in deep desulfurization. Therefore, considerable attention has been paid to non-HDS techniques, such as adsorption, biodesulfurization and photocatalytic oxidation, etc. Among them, the photocatalytic oxidation desulfurization is the most ideal "green chemistry" technology for deep desulfurization with mild operating conditions. 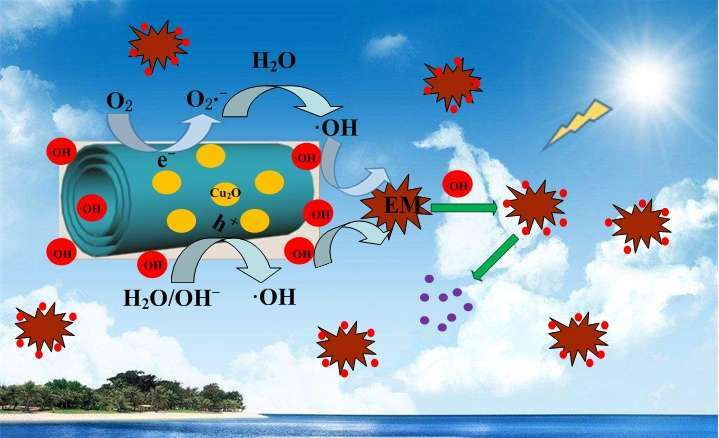 Some researchers have reported nanocomposite as an effective photocatalytic functional material than the host alone, such as Nb6O17@Fe2O3, Cu2O@TiO2 nanotube arrays, etc. Titanate nanotubes attracted a wide attention for the high photocatalytic activity under UV light irradiation. However, titanates have a relatively wide band gap and is utilize only under UV light, thus the photocatalytic activity is limitation. Moreover, when Cu2O is used as a photocatalyst alone, it is a limitation what the electrons and holes excited by light cannot be transferred efficiently and are easy to recombine. Some team of researchers introduced an innovative strategy by compositing Cu2O nanoparticles with titanate nanotubes, which will result in the stronger visible spectral response and wider absorbance. This technology provides a new approach to reduce the bandgap energy and prolong the separation of photo-generated electron-hole pairs, which resulted in better photocatalytic activities for photodegradation of organic pollutants more thoroughly. The most significant aspect of my study: Composting Cu2O nanoparticles with H2Ti3O7 nanotubes as an effective photocatalyst applied in desulfurization, it was rarely reported that the construction and desulfurization application of this functional materials before we research. At first, the photocatalytic oxidation desulfurization is the most ideal "green chemistry" technology for deep desulfurization with mild operating conditions than the current HDS technology. Next, We have synthesized the trititanate nanotubes. Previous researches demonstrated that some layered titanates were better photocatalysts, and the corresponding nanosheets and nanotubes even showed much higher photocatalytic activities than the original layered compound. In addition, we have constructed the Cu2O@H2Ti3O7 nanocomposite, the mesoporous nanoscroll composites possess obviously higher photocatalytic activities than guest oxide nanoparticles or host layered materials alone. The researches suggest that layered materials doped with guest nanoparticles can not only reduce the bandgap, but also inhibit the recombination of photoinduced electron-hole pairs. Therefore, we employ Cu2O nanoparticles integrated H2T3O7 nanotubes by a facile hydrothermal method, it shows that nanocomposite exhibits the excellent photocatalytic performance due to the stronger visible spectral response and wider absorbance, this research that could help develop new energy resources (solar energy) and oxidize organic pollutants for protection of the environment.